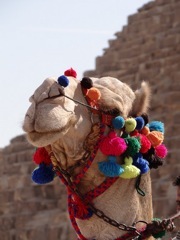 In a cloak and dagger (and camel!) adventure, our friends from Corelight buried the 25th Earth Treasure Vase near the Great Pyramid on the Giza Plateau. Corelight’s co-founders, Leslie Temple Thurston and Brad Laughlin, kept us abreast of developments as they unfolded. Read about the twists and turns, and how, ultimately, the holy vessel was buried on this auspicious day. This entry was posted on Monday, December 19th, 2011 at 9:22 pm	and is filed under News. You can follow any responses to this entry through the RSS 2.0 feed. You can trackback from your own site.